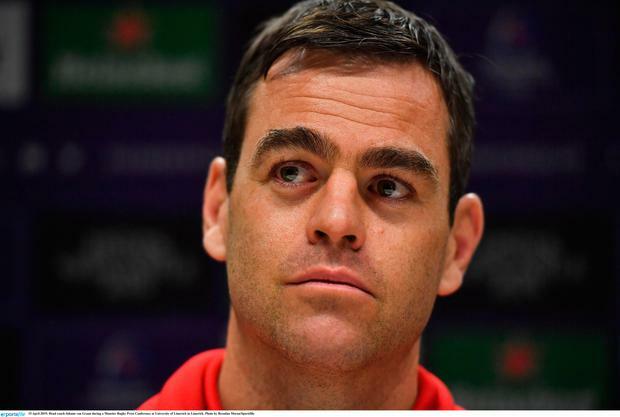 Munster fans' fears of taking on Saracens without Joey Carbery look set to be realised as Johann van Graan was unable to provide a positive update on the Ireland out-half. The South African says Keith Earls and Jean Kleyn must prove their fitness in training this week. Earls withdrew before the Cardiff Blues win two weeks' ago, while Kleyn was replaced with injury during the Irish Independent Park. Van Graan said he would not take a chance on Carbery's hamstring in Coventry, meaning Tyler Bleyendaal will start against the 2016 and 2017 champions who beat them at the same stage two seasons ago. And he said Bleyendaal's difficult outing at the Aviva Stadium that day would have no relevance at the Ricoh Arena this Saturday. "It's still highly unlikely," he said of Carbery. "We'll just take it day by day and then make a final call later in the week. Like I said last week, we won't take any chances with him. If he's ready, he's ready. If he's not then we won't take that chance. "It's a totally new game. "Two years is a very long time in rugby, a week is a very long time in rugby. So, I think we'll just look at where we are at the moment and build from the previous performances. to a massive European semi-final." Van Graan is impressed with what he's seen from Saracens. "Against Saracens, the more you look, the less you find because they're so good," he said. will be on ourselves and we want to impose our plan onto them. "It's a semi-final of Europe, it's a once-off, it's 80 minutes. You work the whole year, the whole preseason for moments like Saturday. "You've got to embrace it, you've got to enjoy it and, they are currently the top team if you look statistically and the only team that haven't lost a game in the Champions Cup, winning six out of six in the pool stages and then beating Glasgow in that quarter-final, it's a top team." Munster have hit the semi-final glass ceiling in the last two seasons, losing to Sarries in 2017 and Racing 92 last season. "We addressed it last season in our review. Took the learnings that we could," he said. "Now we are 11 and a half months, almost 12 months forward from that time, so, if we win at the weekend, then everyone will say we've learnt our lessons and if we lose, people will say we haven't. "Our focus is on ourselves, it's a once-off game. What happens on Saturday has got nothing to do with previous years. "It's different opposition, a different referee, two total different teams. Like I said, you have to embrace weeks like this and we're looking forward to it." Munster have had a settled side in Europe, and van Graan conceded it will be difficult to make changes despite the performance of his fringe players last weekend. "Look, you want to back continuity," he said. "Obviously, the team that played against Edinburgh was very similar to the team that played against Exeter. If you remember the last time I said 'because we haven't played together for a long time, guys have to be backed that I've backed before'. "We've played a few games and a lot of guys have put up their hands, as a coaching group we'll have a look and see how guys come through training this week. "There are one or two 50-50 calls. Obviously, the core of the starting team is well settled. "That's what you want as a coach, is for guys to put up their hands like they did against Cardiff, to a lesser extent against Zebre and at the weekend against Treviso. "It's great that you've got 54 players that have played throughout the season, guys keep on pushing. That's all the players can do, is to keep on pushing. "Once we make a call on selection, then we back our squad." Independent.ie Newsdesk Munster and Ireland legend Ronan O'Gara is concerned over the vast swathe of empty seats in the Ricoh Arena for Munster's Champions Cup semi-final defeat to Saracens on Saturday. Andrew Baldock Mako Vunipola has praised his brother Billy's self-control after he was booed throughout Saracens' Heineken Champions Cup victory over Munster and then confronted by a spectator.